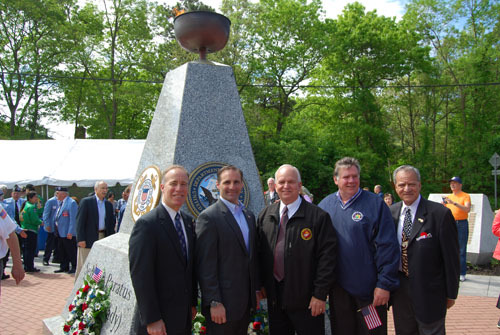 Mayor Allan M. Dorman (center), Village of Islandia, is joined by local elected officials at the village's Memorial Day ceremony at the Veteran's Memorial Triangle on May 24. Also pictured (left to right): Tom Cilmi, Suffolk County Legislator; Anthony Senft, Islip Town Councilman; Al Graf, New York State Assemblyman; and Tom Muratore, Suffolk County Legislator. On May 24, the Village of Islandia held its Memorial Day ceremony at the Veteran's Memorial Triangle, located at the intersection of Old Nichols Road and Johnson Avenue. Local elected officials, war veterans and village officials were in attendance. Following an invocation, Islandia Village Mayor Allan M. Dorman, a Vietnam veteran, recognized those who served our country. Michael Zaleski, Village Trustee, also acknowledged the local veterans groups who have attended the current and previous ceremonies. There was also a laying of the wreaths, with flowers graciously donated by Gina's Flower Shoppe. For more information, call 631-348-1133, or visit www.newvillageofislandia.com.